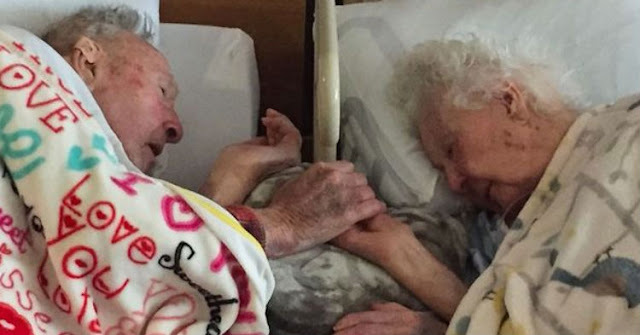 This heartbreaking photo is showing a 100-year-old man and a 96-year-old woman holding hands as death tears them apart after they have been in marriage for 77 years. They are holding hands as they lie in hospital beds linked together. It was posted by their granddaughter. This picture touched millions of hearts as it continued spreading across the internet. It came from Reddit user RealLiveGirl from California with caption: “My grandma, 96, with my Grandpa, 100, hours before her death this weekend. 77 years of marriage”. After it went viral, the girl added: “I know they are my grandparents. But this picture is seriously the saddest and cutest thing I’ve ever seen”. The picture was liked more than 5000 times and generated round 1500 comments to date. Holding hands with your spouse in a warm bed with the loved ones around is the greatest thing ever. This is very deep. There have been other users who wrote similar stories. One user wrote that her grandparents raised her and allowed her live with them. The grandparents were both 74 and 5 hours apart in birth. They have been together since they were 16. The user said that she would have been on the street without them. Another user wrote that he has been in a similar situation. He did not understand it until he lost his grandpa 2 years ago. With this, he lost his greatest support and best friend. This image is what it truly means to grow old together until death does them part. The girl received a lot of hate mail for sharing this photo. She was not sure why would someone have to say bad things like those. And she later wrote: “Thank you. This note made much of the ‘hate’ I’ve received worth it”.